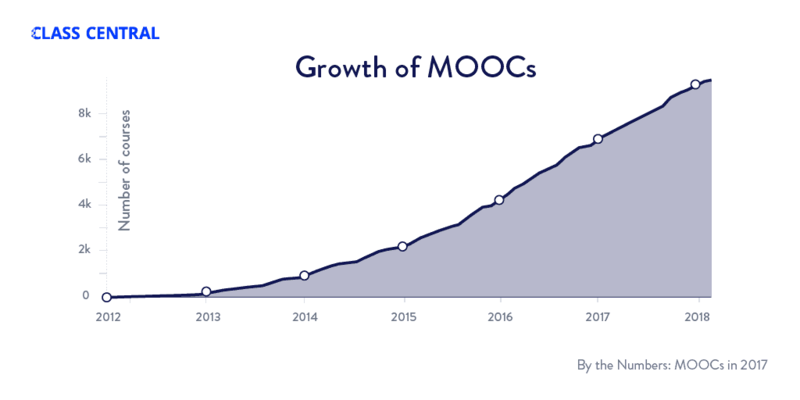 This is the sixth year since the start of the “modern” MOOC movement (which traces its birth to late 2011, when the first Stanford MOOCs took off). For the first time, we are seeing a slowdown in the number of new learners being added. Around 23 million new learners signed up for their first MOOC in 2017, taking the total number of learners to 81 million. This is similar to the 23 million learners added in 2016. The top two MOOC providers in the world (by registered users) added similar numbers of learners in 2017 as they did in 2016. Even if growth in users was fairly flat last year, new courses continued to be created and launched as aggressively as ever. 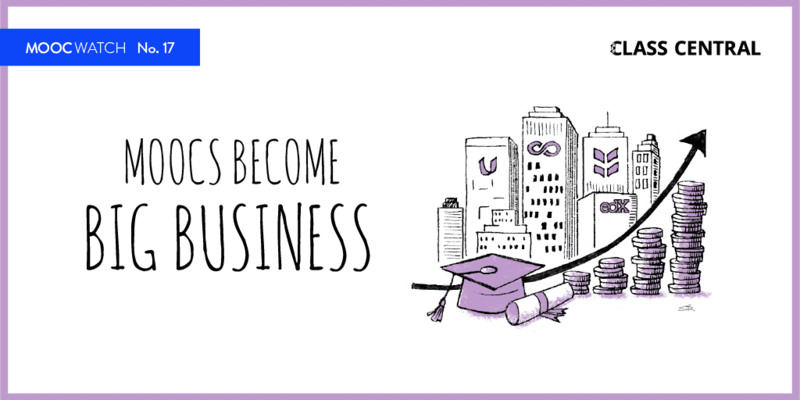 To date, over 800 universities around the world have launched at least one MOOC. MOOC providers are also partnering with companies (mostly tech) to launch courses. 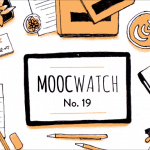 The total number of MOOCs that have been announced stands at 9,400, up from 6,850 last year. The number of total MOOCs available for registration r at any given time has also gone up due to tweaks in the scheduling policy by MOOC providers. 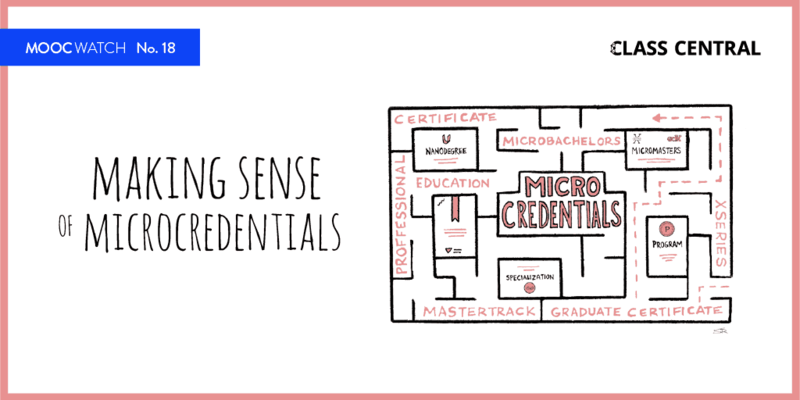 More than 500 MOOC based credentials are now available. 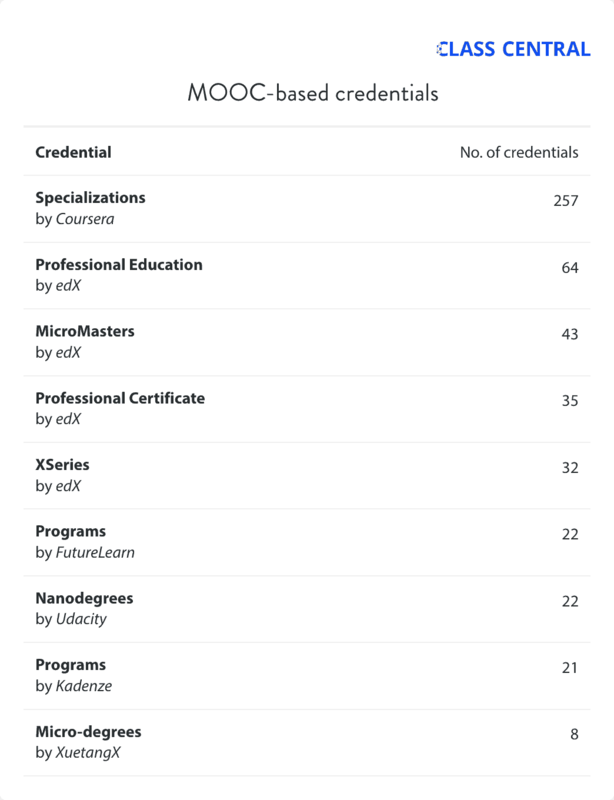 Coursera’s Specializations lead the pack with over 250 credentials; followed by edX with around 170 credentials split across 4 types: MicroMasters, Xseries, Professional Certificate, and Professional Education. XuetangX also launched 8 “micro-degrees”. Many (if not the majority) of the new courses that were launched in 2017 are part of credentials. A few of the longer courses originally launched in 2012 and 2013 have also been split up into multiple courses and re-launched under a credential. Online graduate degrees are a lucrative monetization opportunity for MOOC providers. Initial results from these MOOC-based degree programs have been good.The Online Masters of Science in Computer Science (Udacity and Georgia Tech) has around 6,000 students enrolled. The iMBA (Coursera and the University of Illinois) has over 800 enrolled students, while the Online Masters in Analytics (edX and Georgia Tech), announced at the beginning of 2017, has 650 students enrolled. A simple back-of-the-envelope calculation tells us that the potential revenue to be earned from these three degrees is greater than $65 million, based on the current number of enrolled students. 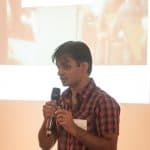 Coursera plans to launch 15-20 degrees by 2019, while FutureLearn has announced that they will launch 50 degrees in partnership with Coventry University. XuetangX, also announced their announced three online Master’s degrees with Zhengzhou University. 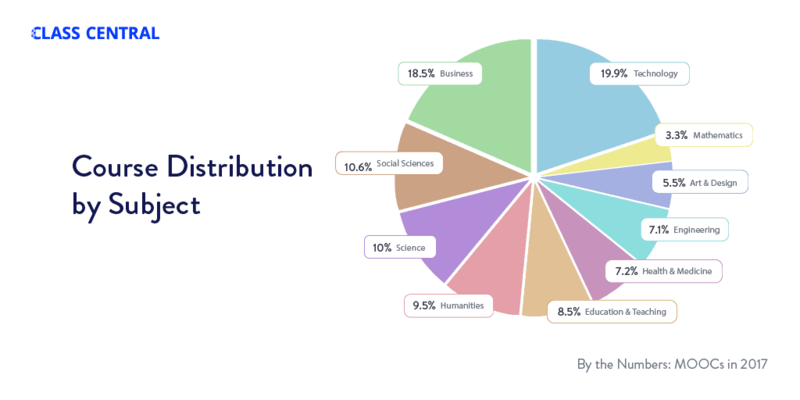 Overall, the distribution of courses across subjects has remained quite similar to last year, with the exception of Technology courses (Computer Science, Programming, and Data Science). This category grew by two and a half percent. Business and Technology courses make up almost 40% of all courses. Not surprisingly, these are the categories of courses that have been easiest for MOOC providers to monetize. The target audience for these courses is a group former CEO of Coursera Rick Levin has called “professional lifelong learners”. Coursera is still the largest MOOC provider in the world with over 2,700 active courses. (Coursera has launched over 3,000 courses, but many have been removed). EdX currently boasts a catalog of 1,800 courses, while FutureLearn has 700 courses. Update March 10, 2018: Earlier version of the article mentioned Udacity has 5 million learners and 78 million cumulative learners by the end of 2017. Its now been corrected to 8 million learners for Udaicty and 81 million cumulative learners for the MOOC space. Fantastic report. Thanks billion .